One point = one line. I'm going to update this regularly. Might be worth putting the no. of games played next to the teams. Or simply to do it after the whole weekend. The fewer numbers, the better. Alarming lack of trees, grass and sun. A few teams will inevitably fall behind on fixtures though and have games in hand. Especially with the league cup semi finals, FA Cups replays etc. But yeah fair enough, you can keep it going like this for a bit. The only league table where you can't go down, that should be a good one for Manchester United. I agree, although some teams will start to pick up games in hand as the season goes on. Better without numbers though. Very damning though on us. Look at that fecking gap. Disgusting. Sadly quite an accurate reflection of reality... nice idea @Maciek! Really good that, apart from our position. Updated after the whole weekend. For those saying we're really close to top four and eight points aren't an obstacle... just look at this gap. Really? Is it the Jose In people that don't get it? Ie the mind bogglingly stupid? Heh. Just realised you are as close to the bottom team as you are to the top team. Heh, joke's on you, we're actually closer to the bottom. When you look at it like that, we really are a midtable team aren't we. How did it come to this feck sake. State of Liverpool there. Was that "King" Kenny's season? Nope, it was Rodgers' first season. This one is even more interesting when presented in such way. 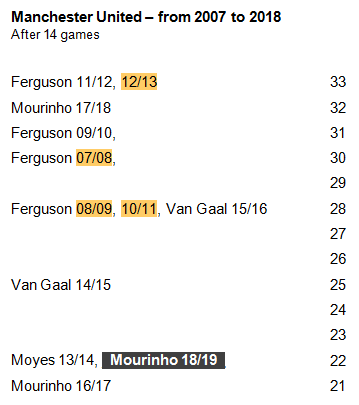 Wait Mourinho actually managed to do worse in his first season? No fun reading, all we can hope for is a miracle, why not ten wins in a row, for example, but maybe it's hoping too much? I really like this version compared to the other ones. Great idea BTW. Yeah Man. United started that season with three wins actually (Bournemouth, Southampton and Hull) but then a derby by Man. City at OT put you into reverse. 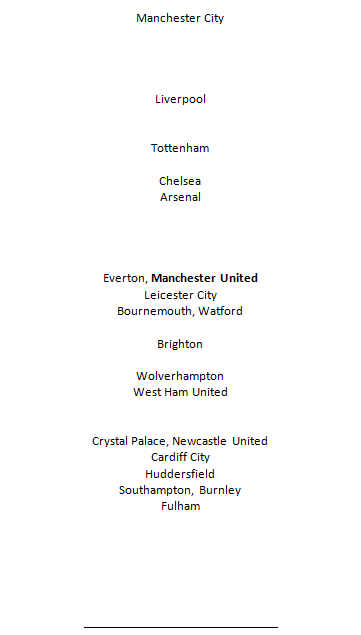 Had a run of drawing 6 out of 7 premier league games (other one was 4-0 defeat at Chelsea). Then a 1-0 over Spurs in December sparked you into six game league winning run. Of course the insurance that season is you started in europa league so were always the main favourite to win that and it got him off the hook really. No such luck now. Dammit, we have already resorted to alternative league tables! That was the season we had our amazing unbeaten run (according to many on here) when we started in 6th & finished in 6th. It's astonishing that we're 16 points and 38 GD from the top, and it's only early DEC. It's gonna be a new record come may.